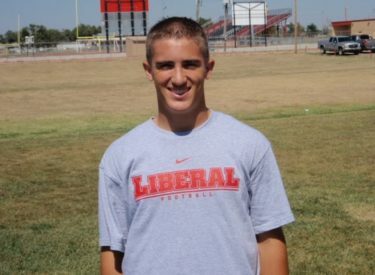 Liberal senior quarterback Slader McVey is the Mead Lumber Athlete of the week. McVey has completed 40 of 68 passes for 551 yards. McVey has tossed seven touchdowns and one interception for the 2-0 Redskins. McVey has rushed for 77 yards and one score. Last year, McVey passed for a school record 1,663 yards with 18 TD passes. McVey’s interview aired Thursday morning during the Sportsguys. McVey and the Redskins play Hays tonight at 7 p.m. on Talkradio 1270 and kscbnews.net. Coach Speak begins at 5 p.m. with Redskin Pre-game at 6 p.m.